WASHINGTON – Sen. James Lankford (R-Okla.) said the United States could eliminate the deficit in 10 years if the government “chipped away” at it every fiscal year. Lankford explained that it would take more than 450 years to pay off the national debt in full if the government was able to reach a $50 billion surplus every year. The national debt is currently $19.8 trillion. 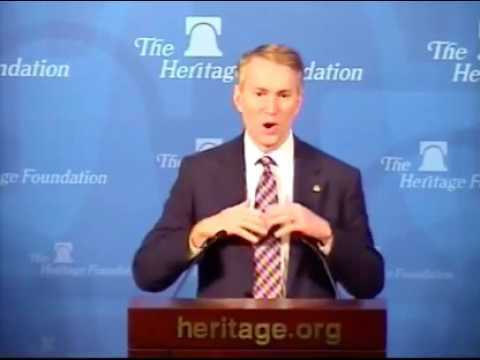 “If we really worked hard and stayed on focus, we could work down our deficit to zero in about 10 years if we chipped away at it consistently,” Lankford said at the Heritage Foundation during a presentation of his new report, “Federal Fumbles,” which highlights some of the federal government’s “wasteful spending” of taxpayer dollars. To demonstrate the size of the national debt, Lankford laid out a hypothetical scenario of the federal government eliminating the deficit and creating a $50 billion surplus each year. According to Lankford’s calculations, it would take about 460 years for the federal government to eliminate the national debt with a continuous surplus of $50 billion. “If we had a $50 billion surplus for 460 years in a row, approximately twice as long as we’ve been a country, then we can pay off our debt,” he said. Lankford said he was “stunned” that the nation’s debt and deficit were hardly discussed during the course of the presidential campaign. “No questions from reporters. No conversation, really. No look at long-term entitlements. No conversation on how we are spending and what we are spending on based on priorities. It was silent, and my fear is Americans are growing numb to the amount of debt and deficit we have,” he said. Lankford’s latest report, which was released on Nov. 29, includes 100 ways the federal government is not spending taxpayer dollars wisely, such as the National Institutes of Health paying $2 million for a study on whether or not children ages 5-8 will still eat food after someone sneezes on it. “I could do that study for less than $2 million,” he said. The report mentions the payments some federal agencies have made in error. For example, the Department of Agriculture, which manages the nation’s food stamp program, has made $30 billion of improper payments since 2009. “Each year it continues to go up instead of down,” he said. The report also included the Medicaid improper payment rate, which has hit $142 billion over the last 5 years. While compiling the items in the report, Lankford said he discovered that the federal government spends $80 billion per year on information technology and some agencies are still using floppy disks. He also explained that Congress allocated millions to crack down on corruption and violence in Central America to reduce the number of migrants crossing the U.S.-Mexico border illegally. Lankford said $57 million of the taxpayer money was spent on climate change initiatives instead. “It was spent on something totally different than what it was intended for,” he said. Last year’s report from Lankford’s office highlighted a $5 million Twitter page the government set up to discourage people from joining jihad. Lankford said he asked congressional pages if they would set up the page for $1 million, and each one of them said yes. “I saved $4 million at that very moment,” Lankford said.